We decided to develop the app in the Fall of 2010. We were noticing a shift in the field of AAC and several of the districts were no longer requesting AAC evaluations. 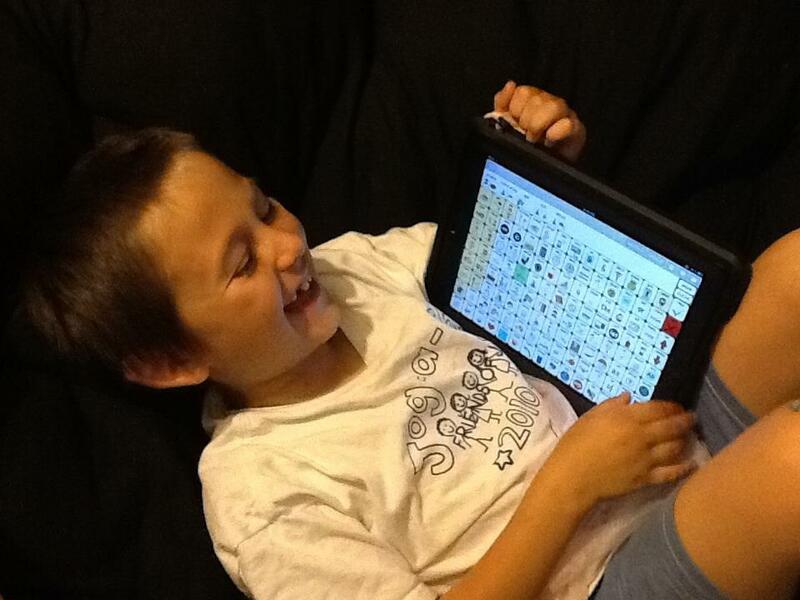 They were getting recommendations for AAC apps from their IT departments, buying an iPad and an app, and saying “Make this work.” After hours of reprogramming to make it functional for the child and clinically sound, we had an entirely different system. We designed the blueprint of Speak for Yourself as a PowerPoint presentation in Panera Bread. It was first released on December 21, 2011. From the time we made the PowerPoint blueprint until its release, it took us a little over a year. We were fortunate enough to find a developer who played recreational volleyball with me on Tuesday nights. He had an extensive computer background and when I told him our idea, he said he had been wanting to learn iOS programming. Of course, he learned it exceptionally well, and the “mistakes” he made in the development became serendipitous for the app. We worked on the app in addition to our regular jobs so I would stay up until 3 am programming vocabulary, and Renee would usually wake up around that time and work on it until it was time for work. Then the developer would merge the vocabulary into one file. It was definitely a labor of love. Our favorite feature is the new search feature that we added in version 1.3. We had that idea before the first release, but the development of it was extensive. We LOVE that we were able to pair pictures with the written words and use word completion so that the children are able to use it independently. We also used a multi-sensory approach so that the feature doesn’t only search for the word, it teaches the individual how to say it using visual, motor, and auditory cues. We’re extremely proud of it, and it’s an unparalleled feature in the field of AAC! Our favorite page is the “little” page. It certainly doesn’t have the important core vocabulary that the other pages contain, but it’s more symbolic than any of the other pages. When we would talk about creating Speak for Yourself and about being able to give a voice to the people who need it, people would say, “Go ahead, keep skipping through those daisies!” That page of the app has such a variety of flowers on it, and when we go into that page, it makes us smile, because it’s beautiful. Speak for Yourself was created out of a dream of two speech-language pathologists who wanted communication to be clinically sound, affordable, and successful. We have never stopped skipping through daisies, and as a result, we were able to create Speak for Yourself out of our optimism, determination, and belief that a voice is a basic human right. We were hoping that the end user would be able to develop language. Our hope is that the people who use our app are able to communicate and give information about who they are to the people in their life. We love the stories about the people who are able to do exactly that. We get emails from parents who tell us that they finally know what their child is thinking when they drive in the car. We have been so fortunate to witness life-changing moments that leave parents and school personnel watery-eyed to see a child being able to interact for the first time. When we’re introducing AAC, we’ve always told the children how smart they are, and that this will give them a way to show everyone. We were hoping to change lives with Speak for Yourself, and while it’s a lofty goal, we’re so fortunate to be able to see it happening! We are most familiar with 3-21 year olds, but we have children as young as 2 and adults as old as 56 who are using it. There is a free lite version, so our advice is that if there is someone in your life who is nonverbal, it’s worth trying. Speak for Yourself can start as basic as one word, and can grow to almost 14,000. It has the ability to meet the user where they are, and grow to a large vocabulary with no more than two touches to say any word. Most importantly, the first word that the person learned will always be in the same place, so motor planning remains consistent. As vocabulary is added, nothing has to be “relearned”. What has been the greatest challenge since you developed the app? Well, we’d have to say the greatest challenge has been defending a federal lawsuit in Speak for Yourself’s first year of release. We are so glad to have that behind us and to be able to continue to focus on improving our app. Speak for Yourself is meant to do great things for people. It’s a two time miracle- first in it’s creation and second in its defense and return to the market. 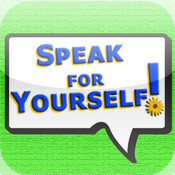 The Appy Chat was held with the two developers of Speak for Yourself app Heidi, MS, CCC-SLP and Renee, MA, CCC-SLP. Speak for Yourself is an application designed by two speech language pathologists specializing in Augmentative and Alternative Communication (AAC) with an evidence-based foundation. This application is consistent with motor learning principles, uses a word-based vocabulary of the most frequently used words in communication, and contains features important in developing automaticity and language. Individuals learn to use their communication device with the same principles they use to play an instrument or type on a keyboard. Speak for Yourself has the capability to begin with one word, but contains almost 11,000 Smarty Symbols® and allows the user the potential to access over 13,000 words, with no more than two touches to say a word. Complex page navigation and scanning are eliminated to allow fast, consistent access to language! Powered by CereProc’s speech system to give our voices character, emotion, and personality. Regardless of their current language level, this application can meet people where they are and provide language for a lifetime, because it’s a basic human right to Speak for Yourself. Version iOS 5 or greater must be installed to use this application. Sure wish you could make a version for BB Playbook. Have followed Maya’s story and yours for quite a while. I would love to try this with Nichole and use on our demo iPad for showing people what is possible!